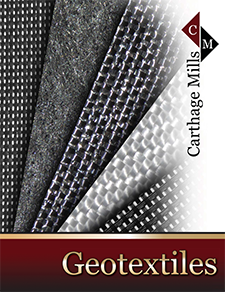 Carthage Mills developed and pioneered the first use of geotextile fabrics in 1958. Originally termed "filter fabrics" or "plastic filter cloths", they were all woven monofilaments. Until 1967 Carthage was alone in its efforts and had the only plastic filter cloths available on the market. But it was Carthage Mills' innovative designs and techniques of construction (many of which are still used today), and the successful performance of those first applications of plastic filter cloths that helped to launch the geosynthetics 'industry' as we know it today (See Geosynthetics: How it all began ...). geotextile, n: A permeable textile manufactured from polymeric material used with foundation, soil, rock or any other geotechnical engineering-related material as an integral part of, and to enhance the performance or cost of, a human-made product, structure, or system. Although geotextiles are textiles in the traditional sense, because they consist of synthetic materials, biodegradation is not a problem. The fibers and/or yarns used in the manufacture of geotextiles are made from the following polymeric compounds, listed in order of decreasing use: polypropylene, polyester, polyamide, and polyethylene. However, the major point is they are porous to water flow both across and within their manufactured plane, but to a widely varying degree. Woven geotextiles consist of monofilament, multifilament, slit-film and/or fibrillated slit-film yarns - often in combinations - that are woven into a geotextile on conventional textile weaving machinery using a wide variety of traditional, as well as proprietary, weaving patterns. The variations are many and most have a direct influence on the physical, mechanical and hydraulic properties of the fabric. The resulting woven geotextiles are typically flexible, exhibit high strength, high modulus, low elongation, and their openings are usually direct and predictable. Nonwoven geotextiles consist of fibers that are continuous filament or short staple fibers. These fibers are then bonded together by various processes that can include a needling process that intertwines the fibers physically (needlepunched), or a chemical / thermal bonding operation that fuses adjacent fibers together. The resulting nonwoven geotextiles have a random fiber orientation with high porosity and permeability, but indirect and unpredictable openings, a thickness ranging from thick felt to a relatively thin fabric, and low modulus and high elongation (needlepunched).